Seven Dead has a great premise that is not followed by a good story. A burglar finds a supposedly empty house filled with seven emaciated dead bodies. The room the bodies were in was locked from the outside with the window shutters nailed shut. An old cricket ball is found atop a vase. A picture in another room has a gunshot through it. A note is found in one of the dead’s hands implying the deaths were suicides. If so, why were they locked inside the room and by whom? 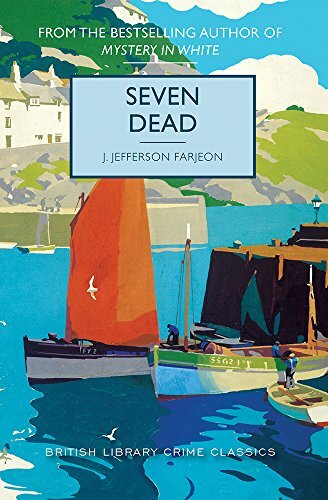 Seven Dead starts with such an intriguing mystery. Unfortunately, the rest of the plot is a muddled mess. Coincidences pile up faster than bodies. A romance takes up a lot of time without moving the mystery forward. It is obvious who the murderer is from the first quarter of the book. Characters appear to think their remarks are extremely witty but are not to modern readers. There are large sections of dialog in pidgin French that are impossible for most readers to understand. The conclusion, for some reason, is told in exposition by the inspector, which kills any immediacy. Seven Dead is strongly not recommended. 1 star. Instead read this excellent golden age mystery, Death Makes a Prophet, by the same publisher, or some Agatha Christie.